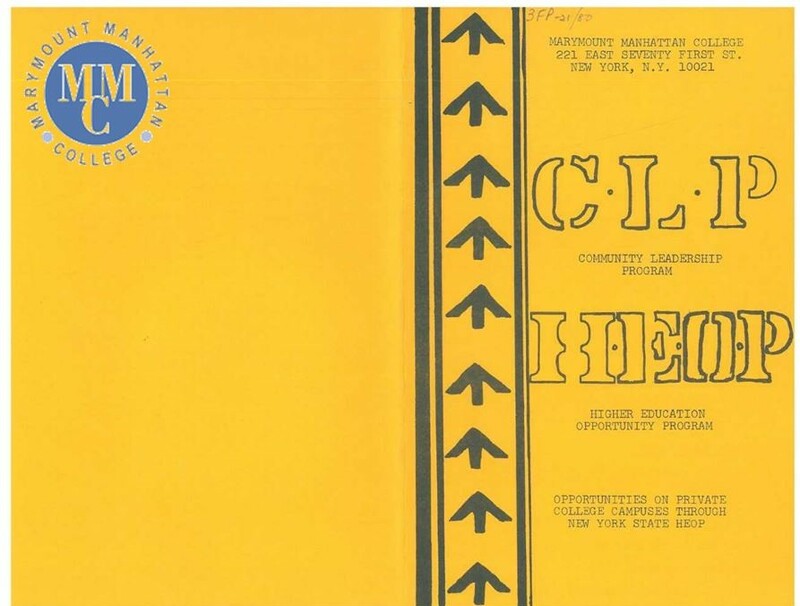 An undated, early promotional and educational brochure utilized by Marymount Manhattan College to advocate their involvement with the Higher Education Opportunity Program. (Known formally as the Community Leadership Program at Marymount Manhattan College). Prior to the late 1960’s, higher education in America was reserved for the affluent, bright and well connected. A trend that would continue until a visionary upstate New York politician stepped up to lead a campaign that would provide the underprivileged and underrepresented a chance to achieve greatness. Arthur O. Eve, a member of the NYS Assembly (1967-2003) and Deputy Speaker of the Assembly (1979-2013) representing districts in Buffalo NY (NYSED.gov 2019). Eve took notice of the plight faced by the underprivileged, especially the youth and proposed legislation that would become known as the Higher Education Opportunity Program (HEOP) (NYSED.gov 2019). The purpose of the HEOP remains unchanged, to provide services to NYS residents who, because of economic or academic circumstances, would otherwise be unable to attend college (MMC 1969, 2). Marymount Manhattan College (MMC) embraced Eve’s progressive vision before it became a reality and in 1967 instituted the HEOP or Community Leadership Program (CLP) on a voluntary basis, independent of state funding (MMC 1969, 5). Led by project director Eilene C. Bertsch, MMC accepted twenty students for the summer semester of 1967. Students spent the summer completing an intensive program focused on reading, writing, mathematics, study skills and communication in order to prepare them for full time matriculation at MMC (MMC 1969, 15). In 1969, New York State officially enacted the Arthur O. Eve Higher Education Opportunity Program. MMC immediately joined and continues to be a member college to this day (MMC 1969, 17). At its core, Marymount Manhattan College has a deep rooted heritage with an emphasis on faith, education and the enrichment of students from all walks of life (McKay 1989, 1). Education at MMC is marked by the development of talents, total growth of the individual and respect for all persons and cultures (McKay 1989, 2). By enacting their own version of the HEOP (CLP) two years before New York State officially passed the act, MMC demonstrated their commitment to the vincentian way of thinking by granting opportunities to those who were otherwise deemed unfit for higher education. Marymount Manhattan College is celebrating its 50 year anniversary in 2019 of being an active participant in the New York State Higher Education Opportunity Program. The program has evolved and has remained a tremendously successful and integral part of MMC. Blanca E. Vega, former director of HEOP at MMC, speaks to how student enrollment has increased and how by utilizing academic, career, financial and social services students are provided with a sense of belonging, which is positively correlated with retention (MMC 2009, 2). Without HEOP, many capable students would be unable to fulfill their dream of a college education. Ingrid Sotelo, former student at MMC is quoted saying “HEOP has been able to offer me a college education in a great private institution in Manhattan, without the support of HEOP I would have been unable to attend MMC because my parents would not have been able to offer me a private college education” (Sotelo 2009). Marymount Manhattan College has held true to their heritage by striving to form students to take responsibility for their own lives and encouraging them to make a positive contribution to the history, society and culture of their times (McKay 1989, 2). Visionary progressives like those who founded MMC and Arthur O. Eve believed not only in education, but education for all, despite financial shortcomings or academic weaknesses. HEOP not only offers an outlet to those at a disadvantage, it offers a voice to a group who were once silent in the academic arena dominated by the more fortunate. It is important to note that HEOP students offer critical insight about social justice and equitable access to opportunity for all members of society (Goodwin 2016, 221). HEOP is not only an opportunity for disadvantaged students to attend college, it is their chance to achieve greatness. Goodwin, L.L. 2016. Resilient Spirits: Disadvantaged Students Making It At An Elite University. New York: Routledge. McKay, R. 1989. The Marymount Tradition in Higher Education. New York: Marymount Manhattan College. MMC (Marymount Manhattan College). 2009. MMC’s HEOP Encourages Students to Strive for a Bright Future. New York: Marymount Manhattan College. MMC (Marymount Manhattan College). 1969. New York State Proposal – June 1969: Related Correspondence. New York: Marymount Manhattan College. NYSED. 2019. “Arthur O. Eve Higher Education Opportunity Program (HEOP).” Access, Equity and Community Engagement Services. Last modified January 22, 2019. http://www.highered.nysed.gov/kiap/colldev/HEOP/.